» Albany projects: Got “visions”? 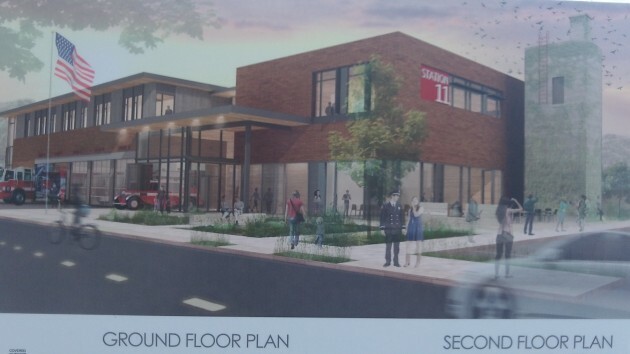 Mackenzie’s preliminary view of Fire Station 11. One of the reasons Albany hired the Mackenzie firm of Portland to design new police and fire stations was the company’s commitment to and experience with a public process in moving the projects ahead. The firm is wasting no time following through. On three Tuesdays next month, the police department and downtown Fire Station 11 will be open for hour-long public tours. (Details below.) After that, at 7 p.m. on Jan. 27 at Station 11, MacKenzie will conduct a public meeting to hear comments and suggestions for both proposed buildings. “The expected outcome will be to obtain input from stakeholders and the community to establish a vision for the facilities,” it says in an announcement from City Hall that came out Monday. You’ll have to overlook the jargon associated with a process like this. “Stakeholders”? They mean residents and taxpayers of the city and its surrounding fire districts, all of whom have an interest in these projects. “Vision”? Well, what would people like these buildings to look like? Grand? Imposing? Or so utilitarian as to look ugly or cheap? The likely answer — whether this is anybody’s vision or not — is handsome enough so passersby don’t gag for the next 50 years but not so fancy that voters will think of them as unnecessarily expensive. As for the inside, the same principle applies: Constructed well enough so the structures will last without wearing out and becoming shabby from use within a few years. But no marble or granite or gold-plated appliances. As for the interior arrangement of rooms and work spaces, we can leave that to the professionals who have to work there. They know what works and what results in wasted motion. For the police station, my one interior suggestion would be to build the entrancehall in such a way that members of the public walking in, for whatever reason, are not made to feel like hostile intruders. In the wake of recent history around the country, it’s more important than ever for the police and the public to be — and act like — part of the same community. It would be helpful if the lobby of the Albany station could advance that goal. The city council hopes that this public process will result in substantial voter support for the bond issue it intends to place on the ballot for May 19, 2015. It’s that tax measure (no more than $18 million, much lower than the $20.3 million voters rejected in 2013) that would pay for most of the cost of these projects. Police, 1117 Jackson St. SE, 1-2 p.m. Jan. 13; 6-7 p.m. Jan. 20; and 5:45-6:45 p.m. Tuesday, Jan. 27. Station 11, 110 Sixth Ave. SE, 2-3 p.m. Jan. 13; 5-6 p.m. Jan. 20; and 5:45-6:45 p.m. Tuesday, Jan. 27. The public meeting begins at 7 p.m. Jan. 27 at the fire station. Of course they aren’t! They want to bill as much time as possible before the levy fails again. It’s simply not going to pass as long as they group both projects on one ballot. I personally would not vote for any relocation toward the West, away from the growing population. Maybe something to consider is keep the existing station and build a “sub station” in the general area of K Mart. That would relieve “overcrowding” at the current site AND provide better service to the East side of town. Bill, One of the many differences between the police and fire departments is how they respond to calls for service. Police on their assigned patrols, can be found all around the city. It is actually conceivable that most of the officers on duty could be on scene or in route to a major incident in East Albany leaving West Albany low in officer count even if the station is located further West. Police typically respond from where they are patrolling and seldom from the station. So, the police station location is not a good argument at all. Fire, on the other hand, do not spend their day driving trucks and engines around segments of the city looking for a fire. In order to keep response times down, keeping your fire insurance rates as low as possible, Albany has four strategically placed stations providing the optimum in response times for both fire apparatus and ambulances. The police substation option was considered but rejected by the community committee tasked with evaluating these projects. There were several reasons for rejection, not the least of which was the long term costs of duplicating the support staff, etc. I hope you reconsider and vote yes for your safety and the safety of all the citizens of Albany for years to come. Hi Jim, haven’t seen you in a while. I and probably most of the citizens committee also preferred the current site. We made our best efforts to make it work. When it came down to it, it would have been far more expensive even if all the surrounding property owners wanted to sell. I had no involvement in the property purchase so can’t speak to that. I would hope that we wouldn’t punish APD and AFD for that decision. That is in the past and we need to move forward. Now is the time enlarge APD and rebuild AFD. Call or come by if you would like to talk further on this. I value your friendship over the years and hope I can persuade you to vote yes. We aren’t “punishing” the AFD. Insisting on putting BOTH measures on the SAME ballot is “punishing” the AFD!